(Watch video http://www.cbsnews.com/news/aging-in-america-stuck-in-the-middle/ . (NB: you need Java installed to view this video or go to CBS Sunday Morning. "This is my calm before the storm," said Kathy Warren, as she sat at her kitchen table doing a puzzle. "It kind of centers me." But Warren is still keeping watch out her window, on her 92-year-old stepfather next door. "As long as I know he's sitting there, doing something, I know he's fine," she said. 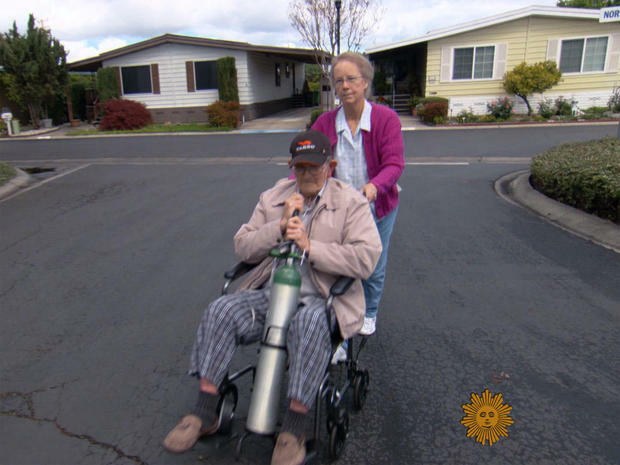 Most of the rest of her day, in a modest mobile home park in Hayward, Calif., will be spent on his care. She's been looking after him full-time since her mother died four years ago. "I haven't been able to visit my son," Warren said. "I haven't been able to see my granddaughter. My life is really on hold." Braver asked George, "Do you feel lucky that you have someone like Kathy in your life?" "Oh, absolutely," he replied. "Like I say, I wouldn't know what to do without her." And Warren, 66, a breast cancer survivor who struggles herself to get by, has been unable to get any government help for her stepdad. "Is it surprising to you that there's just no place where people know that they can turn when they get into this situation?" asked Braver. "It's surprising to me now," said Warren, "but back when I was working, this wasn't even on my radar. And all of a sudden I found out that there really are no resources out there for somebody who is in the situation that my dad is. He's kind of in the middle." "In the middle": Not poor enough to quality for Medicaid (which, unlike Medicare, does cover many long-term care expenses), and not rich enough to pay for long-term care. So the burden falls on his stepdaughter. "I don't look at that as a sacrifice; I just look at it as, that's just the way life is right now," she said. "Like when I had cancer, it's just one day at a time." And she is not alone. According to theFamily Caregiver Alliance, some 45 million Americans are currently caring for an elderly family member. Former Democratic Senate Majority Leader Tom Daschle says the problem of long-term care is becoming a national crisis, as more of us are living longer with limited resources. "I can't tell you the number of people that have told me they've given up everything -- they've sold cars, they've sold property, they've sold furniture, they've sold things that they otherwise would have kept, just to pay for their parents' care," he said. Daschle and a bi-partisan group of former public officials havecreated a task forceto try to draw attention to the issue. "Care is highly-fragmented, and as a result available services and support are not coordinated," he said. Braver asked, "Is there an estimate of how many people aged, say, 65 and older will at some point in their lives need long-term care?" Daschle replied, "The amazing statistic -- and it is still one that's hard for me to get my arms around -- is that 70 percent of people over the age of 65 will need care of some kind, whether in their home or in institutions before the end of their life." That's tens of millions of people . . . and while there are insurance policies that cover long-term care expenses, they are out of financial reach for many. "Unfortunately, only seven percent of people who are in need of long-term care are able to rely on private insurance options today," Daschle said. "These are really big issues for most families. And you tend to put them off until you really have to address them." The title of cartoonist Roz Chast's illustrated memoir, "Can't We Talk About Something More Pleasant?" (a finalist for this year's National Book Award), says it all. "No one wants to talk about it; it's awful" she said. It's the story of the decline of her late parents: her dad, a Brooklyn public schoolteacher; her mom, a vice principal. "You found yourself more and more playing the role of helper," said Braver, "and you were very frank in saying you really didn't want to." "Well, I didn't want to, and they didn't want me to," replied Chast. "So it was kind of likenobodywanted any of this to be happening. But it does." Her parents, like many older Americans, resisted leaving home for assisted living -- "The Place," as they called it. When, in their nineties, they finally made the move, worrying about expenses took a huge toll on the whole family. Thereareother options! In Boston, a group of seniors have banded together. It's called the Village Movement. It began in 2001, when Susan McWhinney Morse and some like-minded friends -- determined not to go into facilities for the aging -- founded Beacon Hill Village. "I have the support to, within reason, live the kind of life I want," said McWhinney Morse. "We are going to, somehow or other, create a way to stay in our own homes that's responsible, that is safe, that will not be dependent upon our children, but allow us to live our lives the way we want to, and yet access help when we needed it." Today, Beacon Hill Village has 340 members, who pay dues of around $1,000 per couple a year. Charitable contributions from the community provide reduced rates for the less affluent. To keep members engaged and active, the village sponsors community outings, like field trips and restaurant dinners. "There are so many activities," said Dorothy Leef, 90. "What do you like about living all by yourself?" asked Braver. "Well, I can do what I want to do when I want to do it," said Leef. "I eat what I want to eat when I want to eat it. There are enough people around that I don't really get lonely." Membership also provides a number of paid trips to the doctor and the grocery store. A small staff, along with many volunteers, assists with any number of large and small problems. "You can call and say, 'I'm losing my hearing, I really don't know quite what I should do.' There's a group of people that will advise you," said McWhinney Morse. "As a male, and feeling statistically I would go before my wife, if something happens, she can pick up the phone and call with any kind of question, and get direction and support," he said. The folks at Beacon Hill Village realized the nationwide need for such services, whenThe New York Times ran a story about them: "Within two weeks, we have 1,000 phone calls from all over the country saying, 'Is there a village here? How do we start a village? How did you you do it? What are you doing? Will you help us?'" said McWhinney Morse. There are now 140 villages across the country, and over 100 more in development. Tom Daschle believes that such grassroots solutions will be the answer, because federal officials just don't want to deal with the crisis in long-term care. "Right now, the political polarized environment we face precludes any serious attempt to address it," he said. Meanwhile, for caregivers like Kathy Warren, there is no relief in sight. Braver asked, "What would happen to him if you weren't around to care for him? ""There's no plan," said Warren, "and I shudder to think what would happen to him. Hopefully I'll never find that out. "?